Jonathan stated this when he received one of the party’s national chairmanship aspirants, Prof. Tunde Adeniran, in his office in Abuja. He said that as an opposition party, PDP needed a competent, reliable courageous and bridge-building chairman who could also correct and tell a seating president the truth. “We must do the right thing. We must elect a chairman that will run the party democratically. “We need a courageous chairman that knows that imposition is destructive. “We need a chairman who by God’s grace if we win election by 2019, when the president makes certain mistakes, he will be courageous enough to correct him. 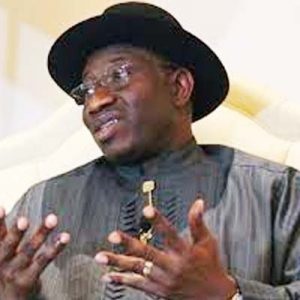 “We need a chairman that can lead us to victory and sustain that victory,” Jonathan said. He stressed the need to organise the party well and elect “good materials” that would lead PDP to victory in 2019, saying that PDP could win next general elections if it did the right thing. “What we need is a person that can give proper leadership for this country, a chairman that can lead us to elect good material for the presidency. He restated that PDP did well from 1999 to 2015, “even though some people came up with propaganda and lies that 16 years of the party in government was a waste. Jonathan said that he led government when criticism for increasing the pump price of petroleum from N67 to N97 when global crude price was going for over 100 dollars was high. He said that the pump price was later reduced to N87 when the price of crude oil dropped “and they attacked us that it was supposed to be lower. Earlier, Adeniran had said that his visit was to seek Jonathan’s support and blessing, and stressed the need for PDP to get its leadership right. He said that his ambition of becoming national chairman of the party was not just for the fun of it but to run the party the way it was suppose to be run.